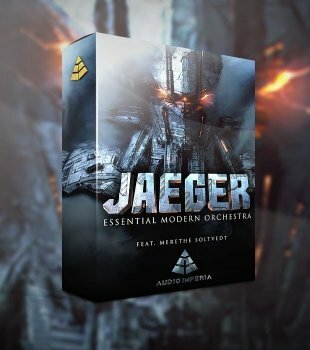 Deriving from the German word Jäger, meaning Hunter, JAEGER is the first release in a series of orchestral instruments that will usher you into a new era of modern cinematic music. As composers, we constantly find ourselves chasing that next creative spark, but our short deadlines don’t always allow us the time to let inspiration hit. You have to simply apply fingers to keys and let the music begin. Though the library is primarily focused on punchy, epic music, it is not just designed to be loud; it is also cinematic. In true Audio Imperia fashion, we added more to the library than you’d normally expect. The orchestral sections are complemented by processed percussion mixes, an extensive sound design section, and most importantly, an incredibly unique vocal section featuring internationally renowned vocalist Merethe Soltvedt. Jaeger features our renowned sound design engine, which is an integral part of many libraries in the Audio Imperia product lineup. The engine really takes the mindset that any sound can be “musical” to another level, with its infinite sound sculpting capabilities and its tweaking richness. A perfect bridge between the worlds of sound effects and music production.